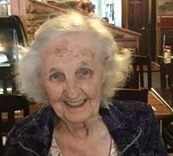 Ann Johanna Spath, 87 of Elkhorn, died Wednesday, November 28, 2018 at Aurora Lakeland Medical Center. She was born December 3, 1930, the daughter of the late Paul and Adela (Blawat) Brunlinger. Ann married James O. Spath in August of 1949. James preceded her in death in the Spring of 1988. Ann was a gentle soul who loved her family and music. Ann is survived by her three children: Donna Huggins of El Monte, CA, Barbara (Arthur) Fischer of Elkhorn, WI and Doug (Kathy Hogan) Spath of Raleigh, NC, and six grandchildren: her siblings; Margaret (Joseph) Greif of Murphysboro, IL, Martha Gaethke of Burlington, WI, Wanda Hockbein of Palm Harbor, FL, Walter (Irene) Brunlinger of Greenfield, WI, Raymond (Jean) Brunlinger of Oak Creek, WI, William (Carol) Brunlinger of Boise, ID and Elizabeth Ortiz of Lodi, CA. She was preceded in death by 1 son: Orville Spath, husband James and three brothers: Robert, Charles and Paul Brunlinger. Private family service will be held at a later date. Memorials may be made in Ann’s name to: The Tree House Child and Family Center W4063 County Road NN Elkhorn, WI 53121. Online guest book at www.haaselockwoodfhs.com Arrangements for the Spath Family were handled by Haase-Lockwood & Associates Funeral Homes and Crematory.